Vector girl holding keys made especially for hotel receptions, resorts and other tourism related companies and projects. She is made only by vectors and is very easy to edit. Download her now for free! Vector girl holding keys suitable for hotels and resorts. If you are looking for a female illustration with welcome and friendly appearance, then this is probably what you are looking for. 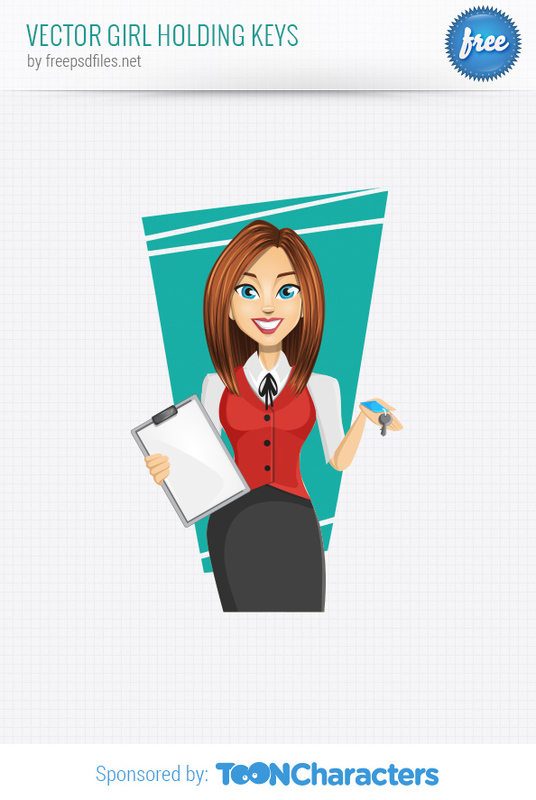 This vector girl holding keys is made in Adobe Illustrator and consists of vector shapes. Thanks to that, you are free to change her size, shape, colors and add text. All of this without any quality loss! That way she can be used for brochures, posters, flyers, t-shirts, web banners, sliders and many more. Go ahead and grab this vector girl holding keys now by clicking on the Free Download button below.